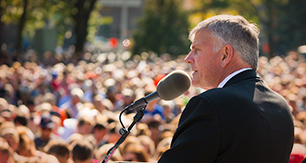 Franklin Graham will take the Gospel across seven states in the Northeast this May. He shared the Gospel in all 50 states in 2016, before returning to multiple cities in Texas and Tennessee in 2017. He made 17 more stops across California, Oregon and Washington in 2018. Franklin will continue to call the lost to repentance and faith—and unite Christians as they cry out to God.